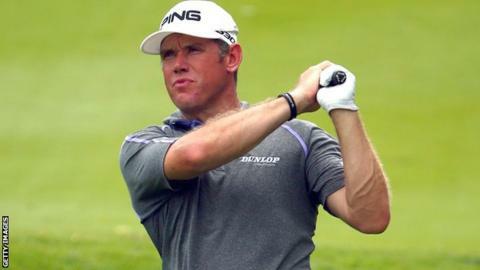 Lee Westwood hit a hole-in-one as he moved joint third at the PGA Tour's Malaysia Classic in Kuala Lumpur. The Englishman, 41, aced the 226-yard 11th and also posted five birdies in his seven-under-par second-round 65 and is three shots off the lead. Ryder Cup team-mate Sergio Garcia is also seven under after mixing six birdies and two dropped shots in a 68. American Billy Hurley III moved two shots ahead at 10 under after six birdies in his opening nine holes. The 32-year-old, yet to win on the PGA Tour, started his round from the 10th and recovered from a double bogey six at his 11th hole to return a second successive round of 67. Westwood won the Malaysian Open on the same Kuala Lumpur Golf and Country Club course on the European Tour in April, his 13th victory in Asia. His tee shot at the 11th landed 10 feet from the pin and rolled into the cup. "I had a hole-in-one in Germany once and won a bar of gold, and that's the only time I've ever won anything," Westwood said. "Occasionally there's been a bottle of champagne for a hole-in-one. I remember pretty much where all of them are, but I'm sure I've forgotten one or two."